Two decades have passed since the Berlin Wall came down. As a teenager living in Italy, this had little impact on my life; it was one of the biggest historical events of the 20th century but it was filled with myth and it didn't have a clear meaning. Few months after arriving in Berlin, seven years ago, things started getting clearer to me: it was obvious that the two Germanies had had for a long time two histories, not to talk about ways of life and that there were still differences between former East and former West Germany. Truth is that, as much as we talk about the night of the Wall's fall, on November 1989, little we know about what happened in the night between August 12th and August 13th 1961. Historical details aside, what shakes me most are the stories of those families being split and their attempts to reunite while the political division still existed, the accounts of people being shot for trespassing the border (always fleeing from East to West), not to mention the complaints of some people who actually think "it was better when we had two separate cities". The fact that Eastern Germans hadn't eaten bananas until 1990 only adds some exoticism to the picture. The American businessman MacNamara (James Cagney), head of the Coca Cola office in Berlin, is working on an agreement to export Coca-Cola into the Russian Market. MacNamara's is trying hard to impress his Atlanta boss, Mr. Hazeltine, with the aim of becoming Coca-Cola chef in London; he also accept to host Hazeltine's daughter, Scarlett, during her travel around Europe, but his stress will only increase because of the girl. In Berlin she falls in love and marries the East Berliner communist Otto Piffl (Horst Buchholz). At this point MacNamara, concerned about his career, will first try to get rid of Otto and then - learning that Scarlett got pregnant - to turn him into a capitalist and thus a more suitable party for his boss' daughter. (...)Permission to shoot in East Berlin was revoked three weeks into production, forcing Wilder to have Trauner build a full-sized replica of the East side of the Brandenburg Gate on the back-Iot of the Bavaria Studios in Munich. 13 August 1961 50. Jahrestag des Mauerbaus is dedicated to the 50th Anniversary of the building of Berlin Wall. Locations and aerial of the Berlin Wall. 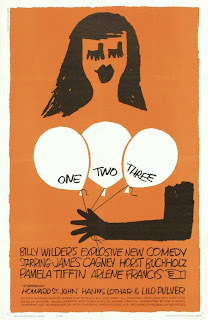 A complete reviews' collection of "One, Two, Three" is in Shooting Down Pictures.